Every year we test our hounds’ hearts using the IW Health Group Regional Scheme which has the support of a team of qualified cardiologists. We want to make sure heart tests results are normal before we breed from one of our dogs, but also to monitor heart health throughout the life of the dogs. This allows us to record the occurrence of any heart problems if they happen, and and at what age, and we can spot any abnormalities very early on – which can make a tremendous difference in early diagnosis and treatment if needed. 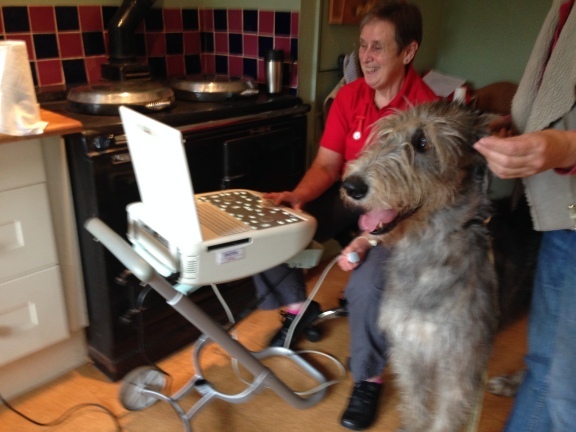 Heart Testing through the Regional Scheme is available to anyone who owns an Irish Wolfhound and details of sessions near to you can be found at www.iwhealthgroup.co.uk/about-the-scheme.html it is done in calm and quiet environment and it is really incredible value at £40 per dog. We thought we would give an insight into what is involved in heart testing, as sometimes it is thought that a heart test simply involves the vet listening to the dogs heart with a stethoscope. A comprehensive heart test actually contains three elements – any one of which taken purely on its own, wouldn’t give us enough information. Auscultation (listening with a stethoscope) – this will tell a vet whether the dogs heart rhythm is regular, and they can sometimes hear whether a heart murmur is present. ECG – This also records the rhythm of the heart, but gives much more information than the stethoscope and provides a printout so that a cardiolgist can examine the actual pattern of beats and see whether they are normal. This can be done standing up or lying down as suits the dog. in the dog, so as an early diagnostic tool this is invaluable. An additional benefit to the breed is that the results are sent back to Dr Brownlie for research purposes. 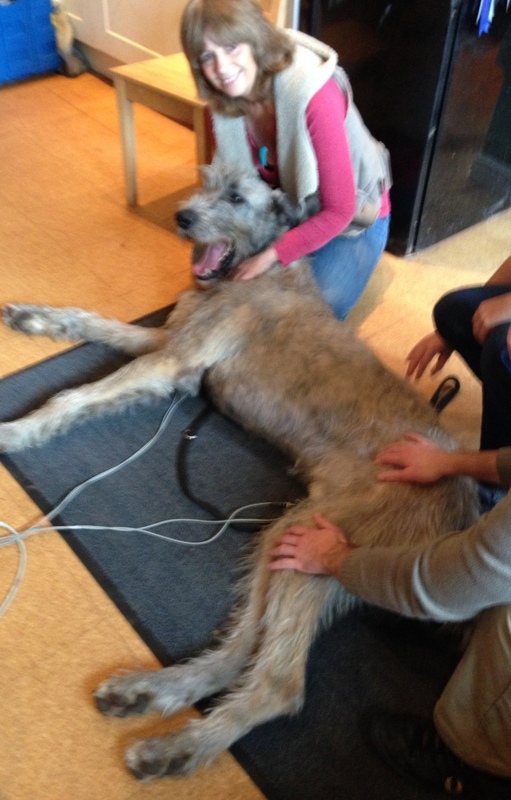 Heart Testing is available for all owners of Irish Wolfhounds and the IW Health Group has set up regional testing sessions throughout the country. You can find out where your nearest session is by checking on the Health Group Website. The Imperial College London has asked Dr Serena Brownlie, the breed’s heart research specialist, to join forces and collaborate in a study that aims to identify the gene marker for atrial fibrillation (AF) in humans through identifying it in the Irish Wolfhound first. The breed’s small gene pool, longstanding pedigree information and ongoing heart testing and research programme makes it well placed to help with this research and may provide a quicker route to identifying the gene or genes that are associated with AF. For this study, older dogs are needed, (8+) that are heart testing free of AF and also those unfortunate cases of young dogs affected by AF. Dogs must have been screened through the IW Health Group recognised heart testing programme and super veterans, 8 and over, are currently being subsidised by the IWHG and will be heart tested free, provided they provide cheek swab DNA samples for this and the AHT’s Osteosarcoma Research Programmes. Taking a cheek swab is very simple and there will be help at the heart testing sessions to make it even easier. Each cheek swab sample must be accompanied by an IWHG/Imperial sample submission form and must be supported by pedigree information and any relevant health history.